Motrr Galileo is raising money through Kickstarter, and it looks to be a promising device. It's an iOS-controlled robotic iPhone platform with infinite spherical rotation capability. Just swipe your finger on the screen of your iPad or other iOS device and Galileo reacts, orienting your iPhone or iPod Touch accordingly. The applications for iPhone photographers are intriguing. Being able to remotely reposition the iPhone (capable of infinite 360 degrees pan-and-tilt at speeds up to 200 degrees per second in any orientation) during recording or sequence photography opens up a new dimension of imaging possibilities. Photographer Dustin Farrell explains how to combine HDR and timelapse techniques in his post, How to Create an HDR Timelapse. Sounds like a great weekend project to me. How to HDR Timelapse from Dustin Farrell on Vimeo. Pro shooter Dan Patitucci offers plenty of sage advice for travel photographers in his post, Making Respectful Travel Portraits. Among the many points Dan makes, he includes, "The ugly photographers, jostling for position, elbowing others out of the way and rudely shoving a lens in someones face have it all wrong, as much for themselves as anyone. Seeing an image but missing it is okay. I'd love to have that shot of the little girl, and hundreds others like it, but they weren't to be. The memory is even more valuable, so much so that sometimes I put the camera away just to witness something." Good food for thought here from a professional with lots of experience. The evening of Monday, March 20, 2012 began lighthearted enough. I had a beer in one hand and a bobble head in the other. 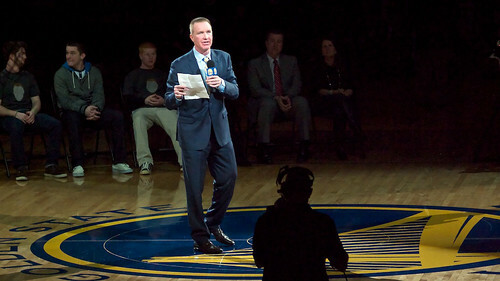 We were at Oracle Arena in Oakland, CA to honor one of the Bay Area's best basketball players ever: Chris Mullin. Chris Mullin thanking the crowd for honoring his career at Oracle Arena. But the atmosphere changed. Poor play by the Warriors in the first half managed to put the crowd in a bad mood. Many were already upset because management had just traded Monta Ellis, the team's current star. All of these emotions surfaced near the end of the halftime ceremony honoring Mullin when the Warriors owner, Joe Lacob, took the microphone to speak. In the darkened arena, thousands of fans booed him and persisted doing so even as Mullin came to his rescue. It was a moment that had our group looking at each other in amazement. "Is this really happening?" As always, Chris Mullin conducted himself with poise and class. That's one of the many reasons he's in the Hall of Fame, and 20,000 others attending that evening are not. I was intrigued by a new free photo sharing service called Blinq. 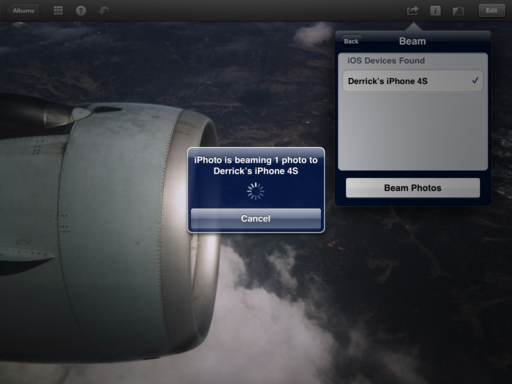 In essence, it facilitates seamless image sharing among your computers and iOS devices, even to the point of being able to tap your iPhoto or Aperture library from an iPad or iPhone. 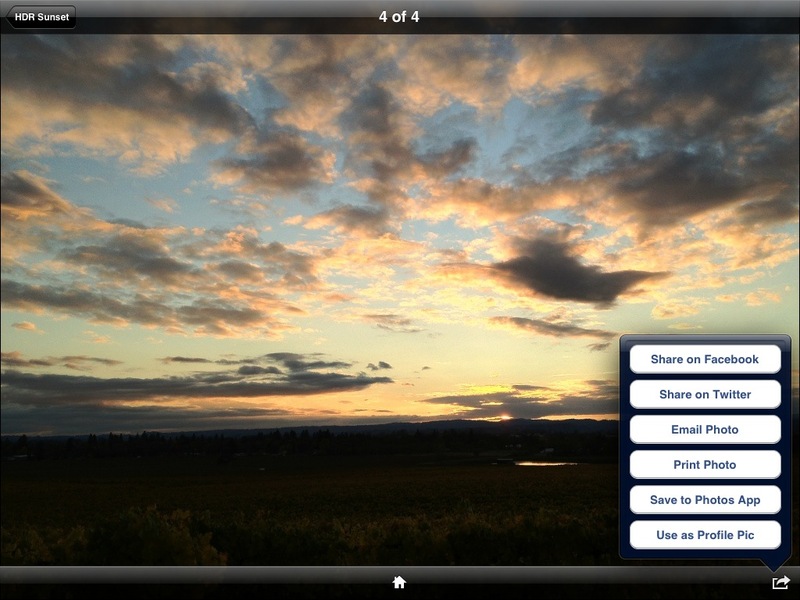 Then, beyond that, you can share selected images with friends and via social networking. This type of widespread capability usually makes me a bit nervous at first, even if I like the flexibility. But after just a short bit of testing with my Mac, iPhone 4S, and iPad 2, Blinq seems more like a smart facilitator rather than a "grab your stuff" service. The images live on your devices, not their servers. When you share stuff from an iOS device, a folder is created in your Mac's Pictures folder titled Blinq, and the images are placed inside via dated folders. I made an alias of the Blinq folder and placed it on my Desktop for easy access. The files are compressed during transfer. The screenshot I used for this article originated on the iPad. If I were to email it to my Mac via the Photos app (the old fashioned way), it arrives as a 1.2 MB PNG file. Sharing the same photo with my Mac via Blinq, it arrives as a 215 MB JPG. Both images look about the same, side by side, even at increased magnification. If you want to tap your iPhoto or Aperture library via an iOS device, Blinq handles that well, as long as you're using a default library name. If you create custom Aperture Libraries, as I do, Blinq can't see them. Overall, this service and its apps seems useful for photographers with multiple devices, including Windows machines. They have apps for both platforms. I'll keep testing and keep you posted. TDS member Brandt Ryan talks about the tip, "always look behind you," and how it led to this photo he captured. "Not long ago I was in San Francisco (first time) and was trying to get some good shots of the Golden Gate during and after sunrise. I had my tripod and composition setup and had been going at it for much of the morning. "As fate would have it, I remembered a tip from Martin Bailey about periodically checking behind you, particularly when you have been shooting a setup shot (Golden Gate). For whatever reason, this tip popped into my mind. 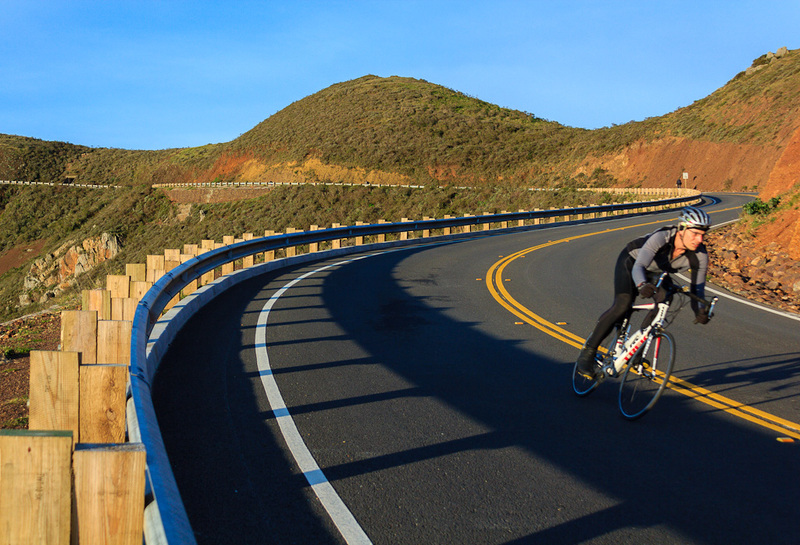 So I turned around, brought the camera to my eye and noticed the road was a nice S type curve, and that a cyclist was racing down it, completely focused and aware of his "line".
" I quickly set camera to Tv mode (shutter priority), flicked the dial somewhere past 1/500th of a sec and snapped 3 bracketed shots, which had been the setting I was using for the bridge and didn't have time to change. I ended up with 3 images--this one being the last. The previous two show the cyclist about one bike length back from the one before. "I like the shot--but I really like the fact that I had the awareness to turn around and check out what was happening behind me. The title of the shot, "Awareness," speaks for itself, I think, especially when one reads the story behind the photo :) Cheers to Martin Bailey for the tip, and thanks to you Derrick for a wonderful podcast." This is our 219th Grab Shot! Wow. If you want to review the collection that began back in 2006, go to our Grab Shots page. Here's a crazy idea for a nimble studio set up: two iPads running Photo Soft Box to illuminate your subject, then take the picture with an iPhone 4S using Camera Awesome. 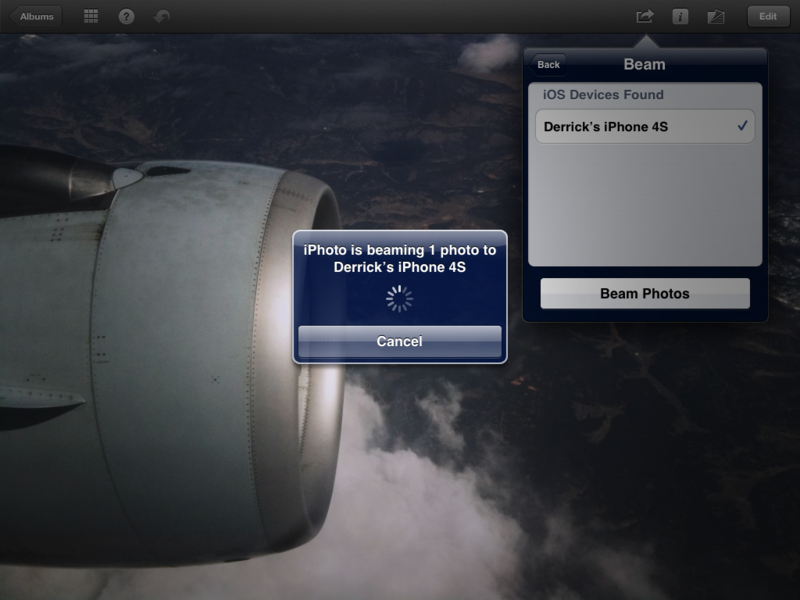 For the finishing touch, open the image in iPhoto for iOS to crop and remove the location data. Now all that's left to do is upload the image from iPhoto to Flickr. Sounds like a lot of fooling around, doesn't it? But take a look at the picture. Not bad. I know the iPhone isn't a 5D Mark III, but it does OK in a pinch. I created the whole set up on a shelf in a closet. 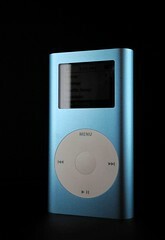 First, I set the iPod mini on a black iPad case. I then placed one iPad running Photo Soft Box on the left, and another on the right. I moved things around here and there until I got the look I wanted. Since you can set the color temperature in Photo Soft Box, I chose 5500K so I wouldn't have to do any white balance correction later. 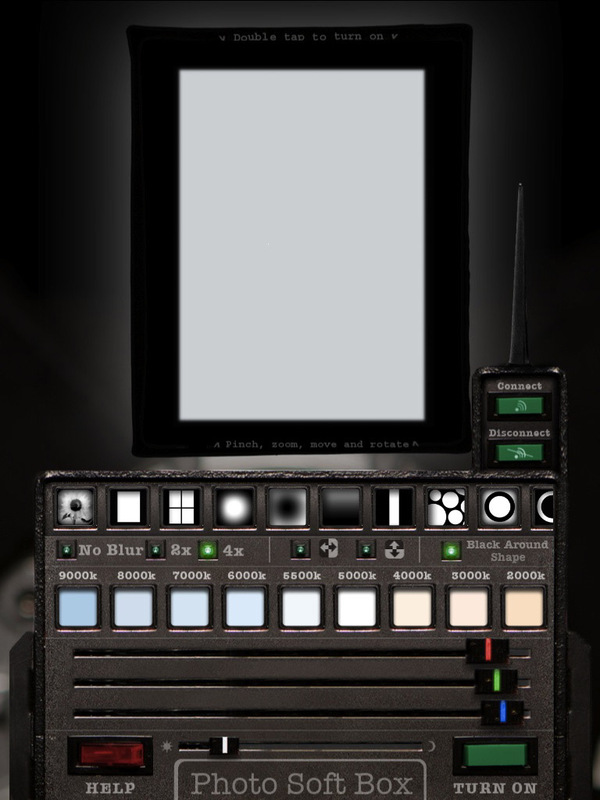 The Photo Soft Box interface running on an iPad. Once you tap the settings you want, double-tap the screen to turn the entire iPad display into a soft box. After I captured the image with the iPhone, I opened it in iPhoto for iOS for cropping and to remove the location data before sending it up to Flickr. So, two soft box lights ($2.99 for the app) and the iPhone 4S for my ultra nimble studio set up on the go. If I were just using these tools for this, you could say that it's a rather pricy portable studio. But obviously I use the iPad and iPhone for a million other tasks. Well, now make it a million and one.